A while ago I added some of my artwork to Red Bubble – a site that applies artwork to various products such as mugs, clothing, stationery and throw pillows. I haven’t told anyone about it before now, because I’m really not sure how I feel about it. Does having my artwork on a mug or sofa cushion devalue the original? Or does anyone really want this stuff? I love the bag with your floral work on it. It’s charming and tugs mightily at my heart strings. 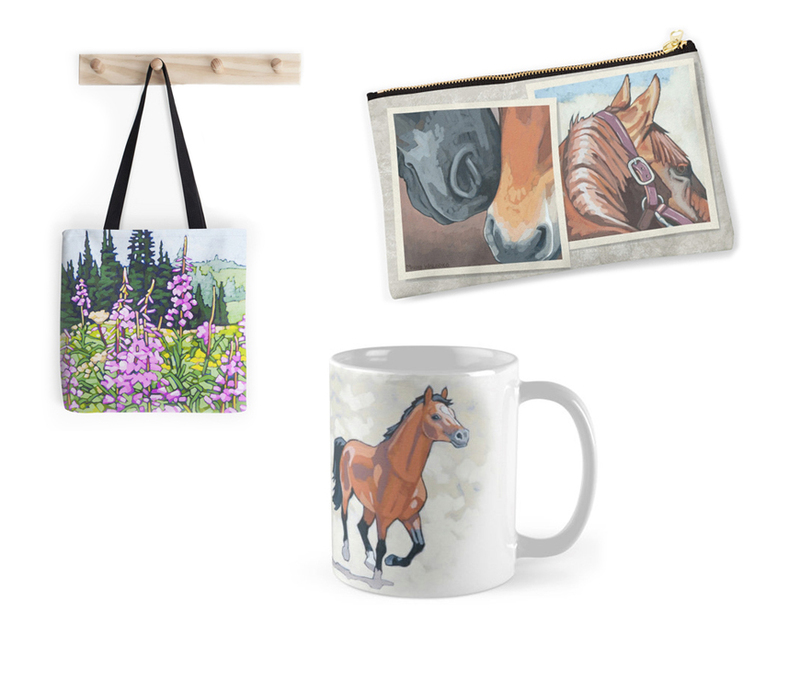 It looks awesome on everyday items!…..great idea for people who might not be in the position to purchase high quality artwork but still want to be able to see it everyday. I’ll be owning some pieces! Thanks for the feedback Greg! Perhaps I should add more artwork. That remains to be seen. But thanks! We were just in the UK where we visited many museums, art galleries and cathedrals. Most of them had wonderful gift shops full of mugs, fridge magnets, cloth shopping bags, tea towels, etc., etc. Many of these had images of famous works of art or famous artifacts or buildings. I never once thought that the original was in any way devalued by what was for sale in these shops. In fact, I bought your painting Vines at Road 13 a while ago, and if I saw that image on a mug or shopping bag, I’d think proudly, “I have the original!”. Hi Nancy. Great to hear from you and thanks for your comment. You’re right. Wonderful art decorates all kinds of items and encourages everyone to enjoy art – at home, at work, everywhere. I do have fun formatting my work to fit various objects.